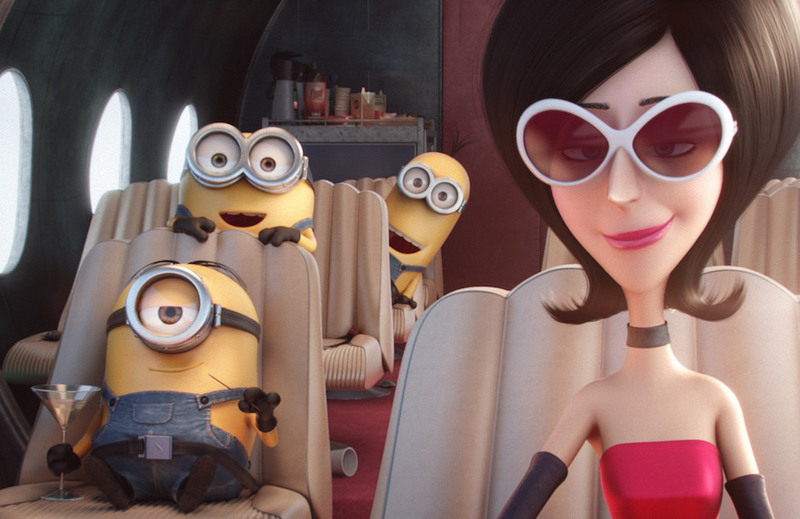 The incremental success of the Despicable Me films has been one of recent mainstream animation's most pleasant surprises. 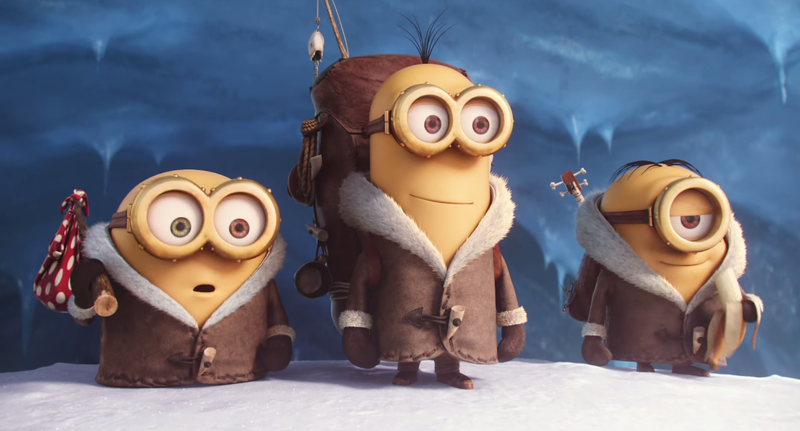 Who would have thought that Illumination Entertainment, which has spent years milking the Ice Age series to death, could also have struck lucky lightning with this likeable comedy and its entertaining sequel? Certainly the films have been among the best things that Steve Carell has done, notwithstanding his recent contribution to The Big Short. 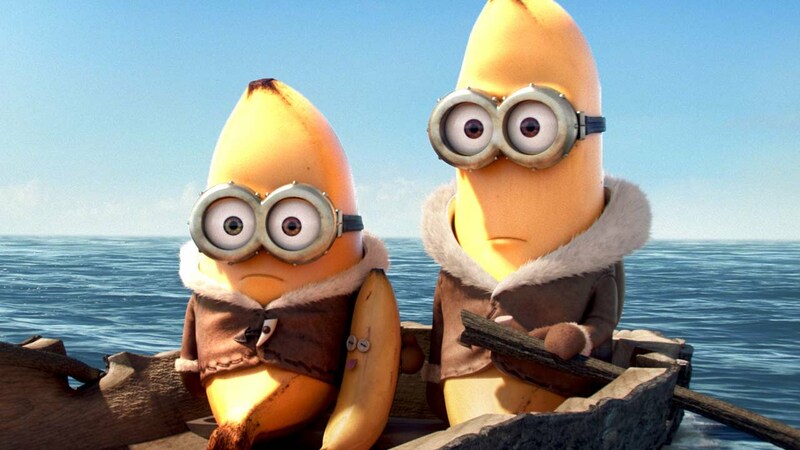 Given that the Minions have become the mascot for the Despicable Me series, it was perhaps inevitable that they would get their own spin-off film. But spin-offs from major franchises are a tough beast to predict; for every cynically commercial cash-in, like Puss in Boots, there is a genuine surprise, like Twin Peaks: Fire Walk With Me or This Is England '86. 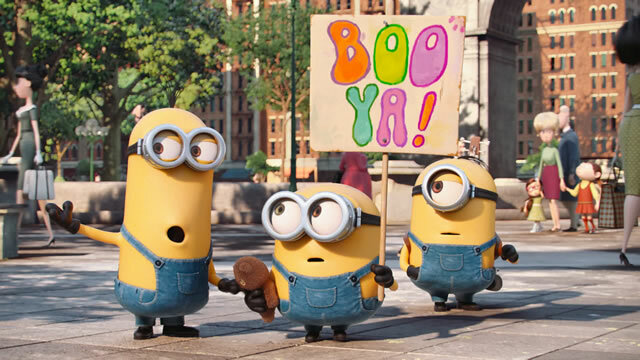 Minions is in the rarest camp among spin-offs, managing somehow to surpass its source material to deliver a genuinely hilarious comedy which rivals the best work of Aardman. The comparison with Aardman is not empty praise, nor does it come without much soul-searching. 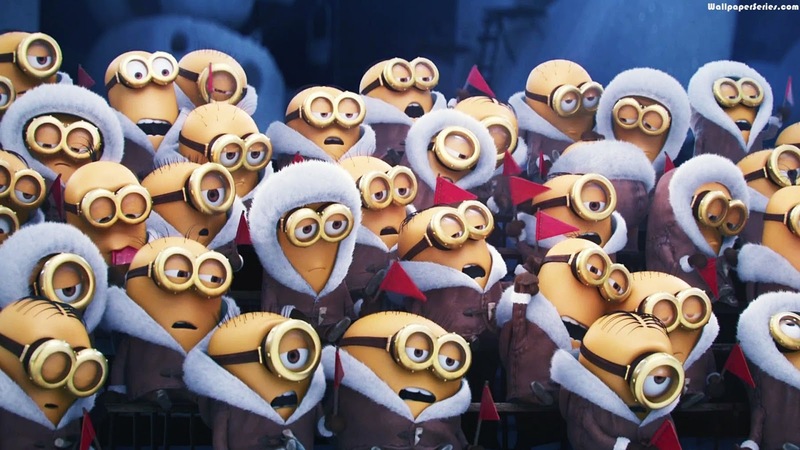 Ever since The Wrong Trousers (or arguably, A Grand Day Out), the company has been held up as an example of what old-fashioned, character-driven animation can achieve. Even without the lasting international appeal of Wallace and Gromit, the likes of Chicken Run and The Pirates! In An Adventure with Scientists! display the same principles of painstaking attention to detail, intelligent plotting, well-written characters and jokes for all the family. The company has a level of film literacy that is hard to top, but its outputs also manage to be accessible for everyone. Minions may not be as richly layered as something like Curse of the Were-Rabbit, which was Nick Park's ingenious and hilarious spin on Dr. Jekyll and Mr. Hyde. It's not necessarily the kind of film which you would watch repeatedly to spot all the little pop cultural jokes that are littered throughout, and it may lack the immediate tactility of the stop-motion claymation pioneered by Park and Peter Lord. What it is, however, is a thoroughly digital demonstration of the lasting power of visual comedy, and of the legacy of silent cinema which still looms large over children's animation to this day. In silent cinema, there is a more conscious emphasis on gesture, posture and facial expression, with music and inter-titles filling in the blanks for the audience. For all the technical shortcomings of silent cinema, and however much it played to and created stereotypes, silent films were able to figuratively 'speak' to everyone; they had to convey universal themes through easily-told stories and familiar imagery. Since the talkies came along in the late-1920s, films have to some extent become more word-orientated, with actors now focussing on more subtle emotions and technology advancing to the point where you no longer need to mug to the camera in strange make-up to get across the fact that you are angry, scared, evil or brave. 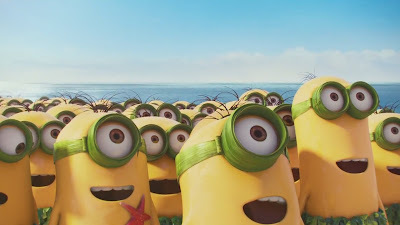 By making its central characters capable only of speech which is largely nonsense, you would think the closest comparison for Minions would be Teletubbies. In fact, the film in both its character conception and its execution is closer to the work of Sylvain Chomet on Belleville Rendezvous and to a lesser extent The Illusionist. By effectively removing or minimising speech, directors Kyle Balda and Pierre Coffin use physical action and situational comedy to drive the plot. The story is easy to understand but has some nifty qualities, and the rate of jokes is higher than in many modern comedies. 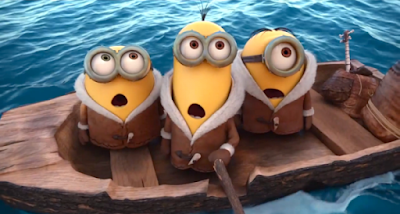 The central nifty twist that Minions employs is the idea of stooges - i.e. 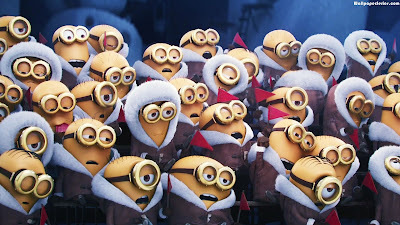 minions - searching for a master. The Austin Powers series has touched on the dissatisfaction of underlings, and Shrek 2 brushed close to the issue in its sequence involving our heroes' infiltration of the Fairy Godmother's factory. 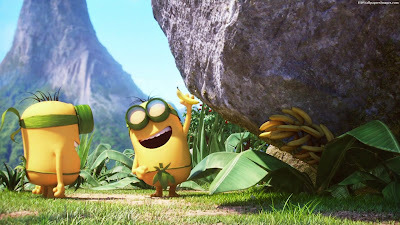 But Minions confronts the issue head on, taking the tired old story of the small guy trying to find his purpose in the big wide world and building an entire civilisation around it. One could almost call it a justification of chivalry, with the minions being a million little Sancho Panzas waiting in vain for their Don Quixote to come along. 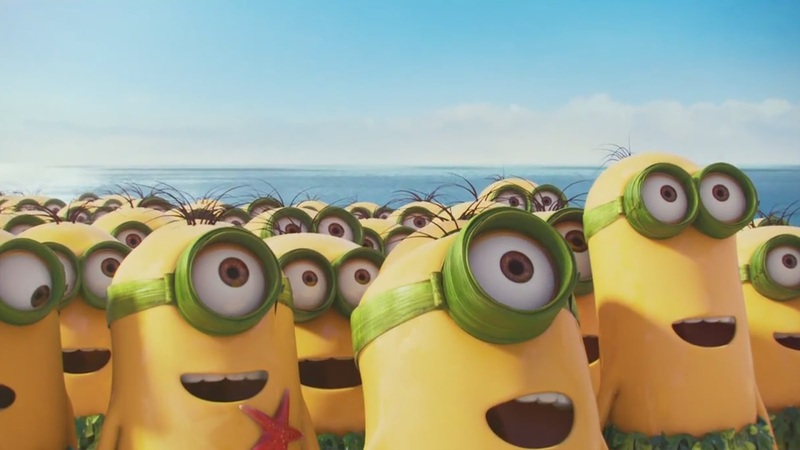 The opening sequence, which breathtakingly chronicles the history of minions, sets up this idea quite brilliantly. There are some stunning physical jokes in here, whether it's Napoleon Bonaparte being blasted across the battlefield by a misplaced cannon, a banana causing the demise of a Tyrannosaurus Rex, or the death of Dracula at the hands of a well-meaning birthday party. Through a series of innocent yet hilarious mishaps, the minions are set-up as every bit as empathetically clumsy as Jacques Tati's Monsieur Hulot or Harold Lloyd's 'Glasses' persona, and the apathetic football match is a great way to top this section off. Because the little guys are so much the focus of the film, it is interesting that the actual villains, particularly Scarlett Overkill, come across as more than a little traditional. 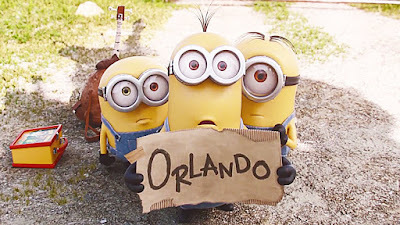 The film does all it can to keep Kevin, Stuart and Bob as the drivers of the plot, even in the scenes driven more by responsive slapstick. 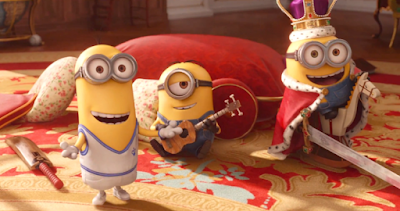 Just as many of the conventions of silent cinema can trace their roots back to those of clowning and pantomime (and commedia dell'arte before that), so Minions' human antagonists do correspond to certain set archetypes, albeit with interesting costumes, unusual names or, in the case of the Tower of London guards, very 1960s hairstyles. I stated in my Pirates! review that the difference between a convention and a cliché can be found in our emotional response to a given scene, story or gag; if we are enjoying ourselves as we paddle in familiar waters, something is a convention, and if not, it is a cliché. You would definitely struggle to argue that Minions is in any way groundbreaking or blindingly original, just as you would find it difficult to argue that Pirates! is Aardman's best film. But being in familiar territory does not mean we should take the painstaking plot and character construction for granted, in the same way that digital animation is not inherently easier to pull off than stop-motion. 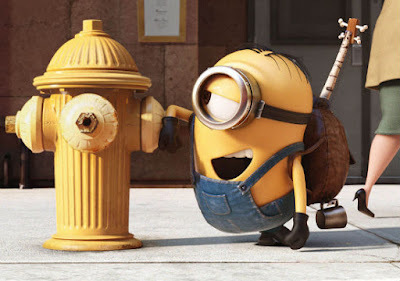 Minions succeeds by taking familiar elements - including central characters who have become icons of pop culture - and delivering the jokes with an amiable efficiency which is very hard to match. It is very difficult to explain exactly why a comedy is funny without simply listing every single joke and thereby spoiling the whole experience. But suffice to say, Balda and Coffin clearly understand pacing and timing, and have learned from their mistakes on the Despicable Me films by taking out a lot of the unnecessary fast-talking which caused the action to drag. The film also benefits from the narration of Geoffrey Rush, still best known for his role as Captain Barbossa in the Pirates of the Caribbean films. Rush has always had an unusual and characterful voice, something which has given him a distinctive presence in films as varied as Shine, Quills and The King's Speech. 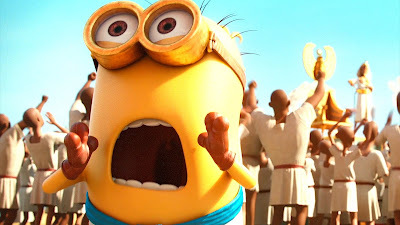 While the script he is bringing to life isn't the most remarkable in the world, his intonations is matched very effectively to the facial expressions of the minions, providing some initial impetus and structure to prevent the whole project from becoming an episodic farce. Minions is a hilarious and highly entertaining spin-off which is more consistently funny than either of the Despicable Me films and arguably the best thing that Illumation Entertainment has produced since the first Ice Age. It's not a perfect film by any means, being somewhat less sure of itself when on British soil rather than in America, but it more than makes up for any niggling lack of originality with its highly effective storytelling and likeable characters. If nothing else it's proof that spin-offs can sometimes surpass their sources, and sets things up very nicely for Despicable Me 3.